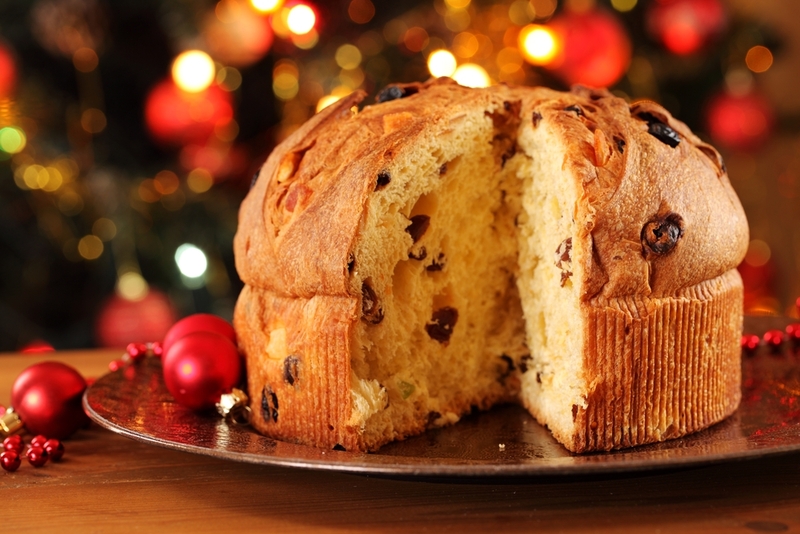 As an Italian or Italian American, you can’t celebrate Christmas without sharing a Panettone with your family and friends. Whether you choose to eat it at the end of “il Cenone di Natale,” with espresso o cappuccino in the morning, or simply having a slice with your favorite liqueur, it puts you in the holiday spirit. It is uniquely Italian and a tradition that is spreading throughout the whole world. The Panettone was created in Milan at the time of Lodovico il Moro 1452 -1508, and it is still produced in the city by bakers and confectioners according to the traditional recipe. One of the most popular legends of its origin is that a cook at the court had to prepare a sumptuous Christmas dinner to which many aristocrats were invited, but the cake, forgotten in the oven, burned. On seeing the desperation of the cook, Toni, a young kitchen boy, proposed a solution: “With the leftovers in the pantry – a little flour, butter, egg, lime zest and some raisins – made this cake. The cook told him, after seeing the cake, if we have nothing else you can bring it to the table. The guests were all excited by the dessert and the Duke, who wanted to know the name of that delicacy, asked the chef, who revealed the secret: This is “Pan di Toni” (Tony’s bread) = Panettone. Since then, many variations of the recipe were created but the original bread pastry with candied fruits and raisin is the only version that counts. Image | This entry was posted in Blog, Culture, Italian, Italian American, Italy, Un Minuto con, Uncategorized and tagged Buon Natale, Christmas, Culture, Dessert, Italian, Italian American, Merry Christmas, Natale, Panettone, Tradition. Bookmark the permalink. Merry Christmas to you and yours, Rosario! Great little piece of history here. I’m thinking of starting a new tradition–Panettone with cappuccino on Christmas morning.